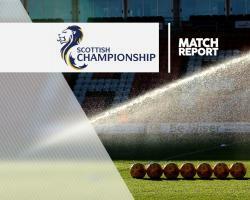 Hibernian maintained their lead at the top of the Scottish Championship despite being held to a 1-1 draw at third-placed Morton. Jason Cummings hit his 17th goal of the season for the visitors, who remain nine points clear at the top after Falkirk were also held to a 1-1 draw. Hibs had a host of early chances, with John McGinn and Martin Boyle threatening, but were made to wait until the 34th minute to open the scoring. Cummings found the bottom corner with his left foot to continue an excellent season in front of goal. However Darren McGregor was penalised for fouling Jamie McDonagh inside the area, and Lawrence Shankland stepped up to slot home an equaliser.